Apple's new iPhone HD: is that it? So is this really the new iPhone HD? If it is – and we'd still say that's a big 'if' – people will be sorely disappointed. The original iPhone didn't look that special, even if it was distinctive, but the 3G and 3GS design really put the cat among the pigeons, giving the iPhone a really tactile, beautiful quality that was cheap enough for Apple to mass-produce. Now a prototype has been found by Gizmodo. And we reckon it's probably as real an iPhone 4 as we're going to see pre-launch. Found in a bar, it's very similar to pics we've already seen from Engadget, while Daring Fireball is also reporting that Apple has indeed lost a prototype. And here we have a completely new design with an aluminium border right round the outside. 'Chunky' is the word that springs to mind. It's a much more industrial-looking design that oddly reminds us a bit of the Nokia N78 where, for example, there are oddly two volume buttons instead of one. That's a very unusual step for Apple, surely? The handset will have a lot more hardware inside it – physically, you can see a front-facing camera, larger back camera with flash, bigger, removable battery and a noise-cancelling extra mic. 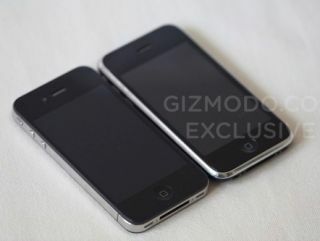 If this was a second-gen model, then fair play, but it's not, and it looks far less streamlined than the 3GS. It's 3 grams heavier, too. Compared to the beautiful HTC Desire and HTC-built Nexus One, well, Apple isn't living up to its usual standards. Maybe the Legend is more of a new iPhone than the iPhone itself. Of course, Apple could prove us all wrong come June and reveal something completely different. Perhaps it's just going to be impossible to keep this kind of hotly anticipated hardware under wraps now, since Apple has so many partners in terms of mobile networks. Our Phones Editor Gareth Beavis reckons that, if it is THE new iPhone, it will certainly provide 3G-owners with a reason to upgrade, even if it looks a bit more of a non-Apple design. "The seam around the side and the split volume control are slightly at odds with Apple's earlier models, raising the question over whether we're seeing a prototype chassis here, and if not, some will really be turned off by the new direction." "But there's a much bigger problem for Apple now - there's never been a leak like this before. If it's real, then next time Jobs takes to the stage, he can only reveal some final specs, and there won't be the hype we've seen in previous years. "And if it's not real, well, that's an even bigger headache for Apple, as this phone seems to have all the features we've been after for years: a better camera with flash, larger battery and front facing camera for video calling. "It's a no-win situation for Apple - so it's going to be fascinating to see how it reacts." Indeed. But while it's sure to set tongues-wagging, one recent visitor to a Redwood City bar will surely be finding they'll need to clear their desk.